This section explains the trade off between the three solvers available in fastFM. The following applies for both classification and regression tasks. Note: The predict method of the mcmc model returns predictions based on only the last draw of the model parameters. This evaluation is fast but usually of low quality. Don’t use mcmc if you need fast predictions! Learning curves are an important tool to understand the model behavior and enable us to use techniques such as early stopping to avoid over fitting. We can warm_start every fastFM model which allows us to calculate custom statistics during the model fitting process efficiently. The following example uses RMSE and R^2 to demonstrate how we can monitor model performance on train and test set efficiently. Please note that we can replace them with any metric we want. # Allocates and initalizes the model parameter. Our MCMC implementation samples model and hyper parameter at every iteration and calculates a running mean of the predictions. MCMC traces are an important tool for evaluating convergence and mixing behavior MCMC chains. 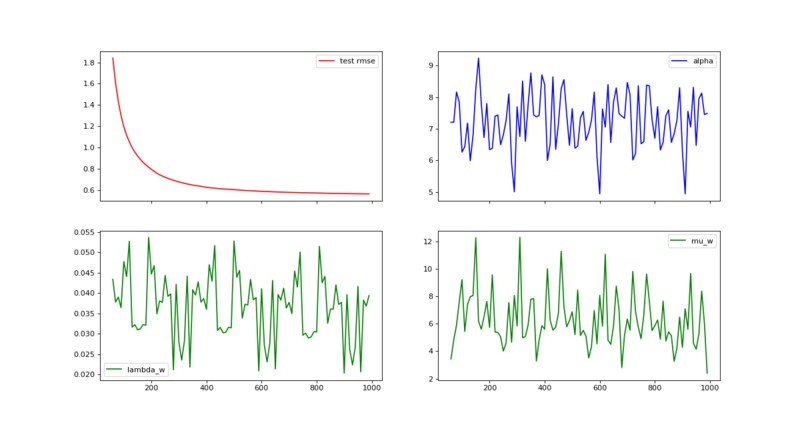 The following example demonstrates how to calculate statistics for predictions, hyper parameter and model parameter efficiently using the warm_start option. # Allocates and initalizes the model and hyper parameter. © Copyright 2016, Immanuel Bayer. Created using Sphinx 1.6.5.